#1) Hanukah is over as of dusk this evening. I'm a little relieved. We had a very fun and social holiday. It was great! That said, 4 evenings of dinner guests, 1 set of overnight guests and one invitation to dinner in 8 nights is a little much. I'm beat. I need to recover from my fun and relaxing holiday! #2) While I'm still knitting (constantly, I'm telling you) like a fiend, I don't get to show any of it because these are still designs for book #2. I'm definitely missing posting about my knitting and can't wait until I can do some of that again. #3) I had the time to think about all this while spinning on my great wheel for a few moments today. (when all works well, it is a very soothing and reflective experience) I took a break for a few days when it came to the great wheel; I was feeling frustrated with my progress in learning its quirks. (Totally normal, I'm always encouraging my students to have patience!) I stopped spinning the Shetland I'd been working with and returned to that easy to spin Cheviot. It just flies out of my hand and into yarn...so I guess I should take my own advice and spin what's easiest for now! "The governor general herself prevented the government's collapse by accepting a recommendation from Prime Minister Stephen Harper to prorogue Parliament until late January. Jean also lamented the escalating number of deaths of Canadian soldiers in Afghanistan, which surpassed the 100 mark in early December. Those deaths, along with the looming recession and political upheaval, have shown how important it is for everyone to work together to make the country and the world a better place, she said. "What these recent events bring to light is how important it is for us to work together - nations, governments, societies, businesses, organizations, individuals, side-by-side," she said. "The fend-for-yourself mentality has no place in an interdependent world, where the decisions of some have a profound impact on the lives of others." Whoa. This quote rang true for me...especially that last sentence, but such a good notion, to hope to make the world a better place. So true that I raced around the web, looking for an illustration to go with this comment. I found it here. Actually, it's hard to show an image of an interdependent world, where we all have to work together...but I love imagining it. Wouldn't that be a wonderful hope for 2009?! 2) It’s a peaceful time to walk our dogs. No one is on the streets. At all. 3) Movie marathons can be fun, but only with DVD’s. Believe it or not, those who do not celebrate Christmas don’t dig watching the marathon of Christmas usually on the TV or radio this time of year. 5) We can be on call to help our Christian friends. Although we definitely did #1-4 this year, #5 ended up being the most important. One of our friends (a Christian clergy member, actually) had a scary car accident on her way home from an 11 pm Christmas Eve service. She is a bit battered in body and spirit but ok. Her car is totaled. We’re going over to her house this evening and will, of course, be on call to help drive her to get to her car to fetch her belongings when the holiday is over. Another friend called; her family went to visit her elderly father-in-law in Toronto. Apparently the father-in-law is in need of extra help and the family will stay longer. However, her eldest needs to return home so I will get to pick up her college age son at the bus station when he comes back into town in the next day or two. I guess it’s nice to be needed! Thanks so much for all your warm wishes for a happy Hanukah and your cheers for my new nephew Noodles. Reports are that he is doing well at home, but the grown-ups are sort of exhausted from his medicalized feeding schedule…every three hours, day and night, via a tube. Still, he is now home, and we are happy. It’s now the fifth night of Hanukah, but having the baby at home with his parents is a gift that we continue to cheer about. Wishing you enjoyment, regardless of what you celebrate. Hanukah is a minor holiday, but full of light and happiness. Since we weren't planning a trip east to New York City to see his family, the professor got homesick for his favorite deli food. With the wonders of modern shipping, he ordered and shipped it to our house. First, I insisted the professor learn to make his own rye bread so he could enjoy his treat. Then, we celebrated the arrival of our very own hunks of corned beef and pastrami. There is nothing like going to Katz's but having a sandwich with some of their ingredients was as close and as good as we'll get in Kentucky. Plus, even with the overnight shipping, it's cheaper than flying to the Big Apple! Another treat has been the professor's mushroom project. A few weeks ago, this big package arrived in the mail from Fungi Perfecti. The professor started another fun winter time science project...growing fresh mushrooms. He chose varieties that are hard to buy here, and there is nothing so good as a just harvested mushroom, sauteed with a little garlic and olive oil. Here is part of the blue oyster mushroom harvest. Next to be harvested: Lion's Mane mushrooms. Yum. The little treats we plan each night of the holiday, like a couple of doughnuts (cooked in oil, as is traditional for Hanukah) make the end of regular work days something to look forward to. At night, we know we'll have a few moments of small presents and treats. The best treat ever happened when we were least expecting it. Yesterday, my new nephew came home from the intensive care unit at the hospital. Noodles (as his older brother calls him!) is now 10 weeks old, and last night was his first at home. Our family is so happy. Nervous and anxious, too--Noodles will require a lot of unusual care, including using a nasal-gastric tube for feeding and lots of physical therapy. The diagnosis for his future is unclear-but of course we're thrilled that he gets to be home now with his mom, his dad (my brother) and his big brother Nate. Now that's a heck of a Hanukah present. Have a good and meaningful holiday, friends! The professor and I saw this car one day in August, along the route we usually walk our dogs. 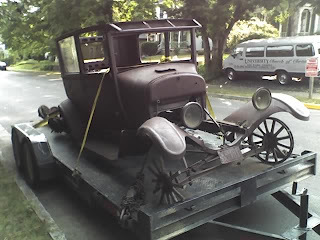 It was gone (towed away) by the time we came back down that block. I've been waiting for a time to post this photo for a while--unfortunately, I think I've found it. This Research Note from the National Endowment of the Arts fits perfectly with an image of an old, rusted out antique car. Why, you ask? Well, according to this research on women artists in the United States from 1990-2005, women will have to work 25% longer to earn what male artists earn. Worse, the pay disparity becomes worse as women artists age...so the older women artists become, the less likely they'll be to catch up to male artists. Women artists will have to work until they are perhaps as beat up as this jalopy and---still don't earn what male artists earn. If you're up on your feminist statistics, this seems like old news. In fact, the current statistic for women nationally is that women in the United States earn 77 cents for every dollar a man earns. (working full time, at comparable professions.) However, for women artists, it's 75 cents to every dollar a male artist earns. If you read the research note in detail (and I encourage that, it's not long and it's enlightening) it indicates that there are exceptions. Younger women (18-24) earn up to 95 cents for every dollar men earn, while older women earn 67 cents for every dollar men earn. The findings are not radically different when compared to other labor markets...but overall, it's bad news for women artists in the workforce. In particular, it indicates that women artists may marry but don't have children with the frequency of the national average. I wonder, is that because it's very hard to have health insurance or provide it to your children as an artist who is self-employed? There are also interesting statistics that indicate that women earn more in Kentucky than the average--but I daresay that is because the overall average for men's salaries is lower here. State by state statistics for this can be illuminating. What does this have to do with social history and the phrase "and she knits?" Social history often looks at the underclass...and if the research starts with 1990, we're looking at historical data from 3 to 18 years ago. Knitwear designers and writers are part of this overall labor category of "artist." Fiber artists, of course, fit in the category. Until we find a way to value women's work and women -- knitted work, written work, design work... the way we value traditionally male work and men-- women artists will be undervalued. Many talented female writers/designers/artists who do not rely on spousal support end up needing to change fields just to support themselves. Alas, even 2 cents on the dollar makes a big difference. So, don't like being compared to a Tin Lizzie? What do you think about the NEA's research note? What are good solutions? All good things must come to an end... This is what I was thinking to myself as I drove up to visit Angel hair Yarn Company one last time. This is a yarn shop where they made me feel welcome, even though I wasn't from Nashville, and was just dropping in when I was in town. I'd go grocery shopping to buy yummy treats that I can't get in my town...and of course, yarn tidbits. So, no big deal--drive 75 miles, do your errands, and stop by for a yarn treat. This is a routine I've been keeping for nearly a year of appointments in this part of Nashville. I hadn't planned to post anything about this...a Rowan Magazine and a pattern book, a few skeins of Takhi Cotton Classic and one odd skein of Rowan Scottish Tweed DK yarn, a row counter, a #3 circular needle...these aren't unusual acquisitions at your local (or, in this case, not at all local) yarn shop. However, just as I was about to check out, a remarkably familiar looking person came in. She thought the same thing about me. We both admired each other's knitting. She wore a floaty and beautiful Kidsilk Haze scarf in two colors. I wore a bright red sweater (knit in Brown Sheep Bulky one ply Lamb's Pride) that my mom knit. We chatted. We realized we'd emailed with each other over a year ago, when I was in the middle of traveling to festivals as research for Fiber Gathering. That time is a blur--I remember feeling sort of exhausted and desperate and just hope I didn't write anything embarrassing to her! Anyhow, you'll never guess who I finally met in the flesh. Only the most famous knitblogger in Nashville. Possibly the most famous knitter within, say,maybe three states....Ann Shayne. You know, the one who just put out her second book? I was pretty stunned by my experience...and decided to blog about it right away. Well, not right away. First I spent nearly 2 hours fighting rush hour traffic and driving 75 miles home in the dark, going...I met Ann. I met Ann Shayne. And she's very pretty--and much taller than I'd imagined. You know, because I could tell how tall she was from her blog posts?! Cool, huh? Have you met anybody famous lately? Spent two hours in the dark in your car by yourself in traffic...? I am still sad that this yarn shop is closing, but gosh, what a way to celebrate my final visit. Wow. Did I say Wow yet? We're expecting a "wintery mix" today and tomorrow. This is a term that means it could rain, freezing rain, sleet, snow or not. There could be a real mess outside, ice everywhere...or just a cold rainy day. We've learned that in, say, Buffalo, NY, this would mean an inch of ice. In the South, it might mean no ice at all. It depends on the meterologist and the neighborhood! The professor and I planned to make use of the morning to take care of things before the temperatures dropped. It's his first day of official university winter vacation (although he works all the time anyway!) so he volunteered to walk the dogs while I do errands before the ice hits. Out the door they go... but Harry gets away from the professor, and takes off down the street after a loose dog. I run into the street after them. Harry is caught in short order and the loose dog? Poor girl... An older, white and black spotted short haired, 50 lb mutt with clear signs of neglect/mistreatment. She looked as though she was nursing puppies, she'd lost hair on her tail, she was cold and wet. Worse still, her only collar was an overly tight pinch collar. This is ok for walks or training--but horrible for a dog to wear all the time. First I tried to help this dog find her puppies, but she was truly lost. When she came up to one door, I knocked and a sleepy looking young man told me she was a stray and maybe her puppies were "around the corner." After a bit, I brought her home and called animal control for help. We set up a crate on the front porch with a blanket and tarp over it, tried to feed her (she wasn't hungry), and took off the pronged collar and went for a regular collar and leash. The professor took our dogs on their regular walk. The animal control lady is named Roxy. She's very nice and knows me by now. I catch a lot of dogs! Roxy was able to tell that this sweet older dog probably wasn't too ill and probably didn't have young puppies, but had probably had many litters...that accounted for the distended teats and tumor like growths. Our gentle but neglected "older lady" went off to the animal shelter. They will help her if they can. We have a good and humane local shelter. Anyhow, this post was meant to be about some yummy apple walnut bread pudding I made. (Leftover homemade challah, cream, eggs, vanilla, cinnamon, brown sugar, apples, walnuts, butter...) I also meant to mention this: My nephew Nate turned 3. Aunt Joanne and the professor gave him a Curious George raincoat and rainboots...and our little guy wears them constantly! All day long, inside at nursery school, and even had trouble taking them off for naps. It's too bad that they don't make Curious George raingear in all sizes, I'm telling you! The professor could use some size 14 EEEE wellies to match his nephew's! The point of this ended up being different, I think...you never can tell what will come up. It's good to keep learning, (my, you showed me how intellectually active you are in those comments!) just so you can hop to it when dogs in need drop by, or when it starts being icy, or when, say, you've got a yearning for some bread pudding. I'm off to settle in. We're baking bread here. We've got some wood on the backporch in case the power goes out. No telling when you might need warm whole wheat bread or a fire on a damp cold day! 2) a. Starting this summer, we began hanging out our clothing consistently on a clothes line. It saves lots of energy, reduces wrinkles, and saves wear and tear on clothing. (clothes last much longer, according to all sorts of research, when not dried in a dryer.) Every Sunday, the professor and I wash our clothes. We hang it out. At night, the professor folds the laundry while I knit. Sometimes, we watch Masterpiece Mystery on PBS. 3) I'm still learning the ins and outs of my new great wheel. It is amazing how subtle and sophisticated the adjustments are for a well-made great wheel...I'd thought that the antique ones needed to be babied because of their age and adjustment quirks, but actually, even new great wheels have the same subtle adjustments in drive band alignment, tension, and other details. As the weather changes, the wheel changes too. I've spun up some gray to oatmeal Shetland wool. The two larger skeins here (Haven't set the twist yet on them) were done on the great wheel from carded rolags. The little skein is from my spindle, done with teased locks. The fleece itself is very soft; my goal was to keep the yarn just as soft. So far, I've managed that softness, but may try some other wools to keep practicing. I visit the wheel for about 15 minutes a day and have my "lesson." Soon, I'll get this--and by that, I mean I'll be able to spin the yarn I want with this wheel rather than letting it dictate to me how things will come out. In the meanwhile, it's nice to know that after 23 years of spinning, I can still be a beginner all over again! In other details, my nephew is still in the hospital but definitely improving (hurray!) and we're still having jackhammering and other construction noises here. I dream of a quiet neighborhood with no "improvements!" Are you still learning something new every day? (I hope so, it's fun.) What's your latest discovery? f) don't like Stephen Colbert/Comedy Central? I'm still enchanted by this Comedy Central clip and was struck by the lack of interest! Jerilea Zempel is an artist and professor at Fordham University. Her work has won NEA grants, been exhibited in the US and Europe, and she's taught at Bennington, Barnard, Rhode Island School of Design and the Maryland Institute College of Art. I found this out via a bio posted about her 2oo9 residency here. Why did I include this in the feminist social history/bio series, "And she knits?" 2) Her work intersects poignantly with typical history topics of war, peace and geographic boundaries. 4) Oh...and here's the big one. This artist uses knitting and crochet as her mediums (media?) to get her point across. That's very cool, in my book. It also fits perfectly into this phrase...."and she knits." You'll note that there's no photo posted here...I didn't want to steal any of this American artist's work without permission, since the border patrol stopped her because they feared "some kind of copyright infringement" when they saw her sketch book and yarn/crochet hooks! Yup, it's what we (fiber) artists do. We run around, "arting" it up, crossing borders and causing mayhem. What, you say? This isn't Joanne's normal blog post...no bread baking or dog photos accompanying the knitting? This is my "social history/bio #2" post. My friend Cindy sent me this link. I realize this is more like recent history, but sure is worth checking out. Enjoy this video clip called "Nailed 'Em-Radical Knitting" and just think of me, crossing the border to Canada next summer. Will the border control folk get suspicious when my landing documents mention "50+ lbs of wool roving, used as a packing material?" EDIT (12/8/08): Note, the below video I posted yesterday is funny and worth watching. It is NOT about illegal immigration. It's about an American artist who uses knitting and crochet to do art and political commentary. It's about her experience with crossing the border entirely legally. I have plenty of choice thoughts on immigration (how did most Americans get here? Oh, and if the immigration regulations were as difficult then as they are now, do you think your family would be here?) however, I didn't bring those up when posted this... this video doesn't either. Many millions of border crossings are entirely legal. Enjoy it. Have a good laugh. Psst. Drop me a line down here. Tell me if you laughed. (I did) Also, do you think it's fair to call recent border patrol activities "recent history?!" 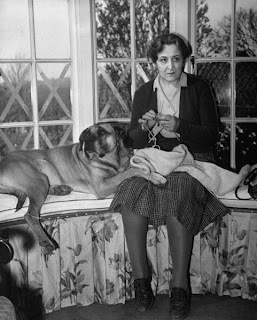 Any other knitting topics or people you'd like to see me cover in my social history/bio posts? Anyway, as the hibernation came on this year, I thought-gee, I feel out of whack. Even though that was entirely legitimate (busy work schedule, sick nephew, overall doom and gloom in the world) I did something relatively clever. I got myself to the doctor to get my thyroid levels checked. "Ah hah!" Guess what? The hibernation is probably caused by my increasingly underactive thyroid. No big deal. Just take a little more medicine in the morning and --hopefully, I'll be better and more active in no time. In the meanwhile, I've been feeling just like Sally looks in this photo. Plum tuckered out! There is big news this week to report. #1) It appears that my social history idea, preferably to do with knitting, is a popular hit! I already have an idea for post number 2, and I'll try to keep that up, off and on, over the next few weeks. #2) Yesterday, my kind editors for book #2 said, "It's time! Start sending your knitted samples to us for tech editing and photography!" I gulped. I said ok. Before I knew it, I'd packaged up roughly 11 designs (but in multiple sizes, variations, etc...so a lot more knitting than that) and Fed Ex'ed them off to the right folk. Now, counting some earlier designs that I'd sent off, I've got roughly 15 of my designs away from home, all worked up since this spring. I got home. I felt completely wiped out. Emotionally exhausted. That's when I realized something. For Fiber Gathering, my husband, the professor, was the photographer. I didn't have to mail any of my designs (or any of the other designers' projects--they all came to me) away for photography, and my tech editor consulted the photos, for the most part, and only referred to the actual garments when absolutely necessary. Sure, I've sent away finished designs to magazines, yarn companies, and books before. Sure. One or two at a time. This was like sending away 6-9 months of my life! I hope they get to the editors safely. #4) You'll note in these funny photos I caught in my office that Harry-the furry dog- is edging ever closer to Sally on the couch. Apparently true togetherness only takes place in the dog world after roughly 3 years of living together....or, in human years, when dogs are in their late 20's to early 30's?! (Harry and Sally were both 6 months to a year old when we adopted them from animal shelters in 2004 and 2005.) Or, as my biology professor says...maybe they're just huddling up because they're cold. Yeah, probably, but I like my theory better! Are you hibernating? Feel bereft when you send off your knitting? How about your dogs? Do they cuddle up just for warmth or affection, too? Recently I was checking out Cast-on's new web revamp. (a fabulous make-over of an already fantastic knitting podcast and webpage by Brenda Dayne) I followed Brenda's knitting link to the amazing photo archive made available by Life Magazine. Of course, I went through the whole archive looking for knitters. Each knitting image is accompanied by several additional photos. I found my favorite, and then I wondered, who was this person? Wippety Wham ..I did some research and --here comes some context. Lady Stella Reading married into the British Aristocracy. In short order, I found out that she founded the Royal Women's Voluntary Service at the start of WWII. Lady Reading mobilized over a million women (mostly housewives) to serve as drivers, air raid wardens, and other essential wartime tasks. As this bio reads, she enabled these women to perform countless other tasks making life more bearable. Lady Reading became Baroness Swanborough after WWII, the first woman to be seated to the House of Lords. Here are the photos I fell for...and then ended up researching enough to learn about this remarkable person. 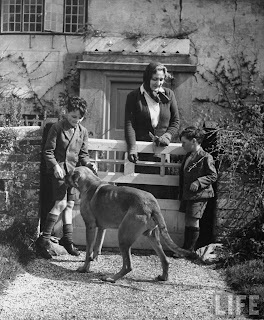 This first one is titled "Lady Reading (C) standing with two small neighbors and her dog Tiger at her country bungalow." It's dated 1943, and was taken in the United Kingdom. Note the size of her dog--I'd argue that she was a strong woman who didn't mess around! What struck me was that her efforts to organize British women helped begin the modern mobilization of women in industrialized nations into the workforce. Women who'd never had professions before became canteen managers, drivers, air raid wardens--people with important jobs that commanded respect. The photos--obviously part of war publicity campaign--show Lady Reading as a real person who contributed to the war effort by working hard. Here she is gardening, organizing and meeting with volunteers, participating in her community's life--and looking like a well-bred lady while doing it. She also apparently had a dry sense of humor...a quote I found? "Look alive. Here comes a buzzard." And? I found out about this amazing person, capable, smart, and intelligent all because...she was a knitter. Cool, huh? If you found this interesting,drop me a line below. Maybe I can do a little more sleuthing and find some more social knitting bios and history from time to time if you'd like.